The film star performing the film star: Asta Nielsen in Die Filmprimadonna (DE 1913) | Silents, Please! “Lower the flags in her honour; she is incomparable and without peer.” So wrote early film theorist Béla Balázs of Asta Nielsen in his 1924 book Der Sichtbare Mensch (The Visible Man). 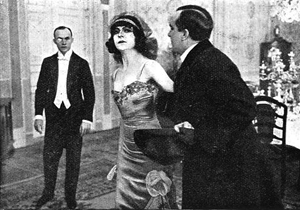 It is well-known that Nielsen was one of the first international film stars; the archetypal screen examplar of the New Woman, acclaimed around the world for her artistry. No secret, either, that’s she’s one of my favourite actresses. 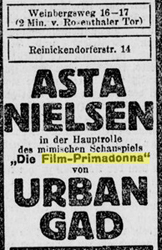 Nielsen was also an astute businesswoman and producer who was keenly aware of her star image, and of her available films, nowhere is this more in evidence than in her 1913 release Die Filmprima-donna (The Film Primadonna). 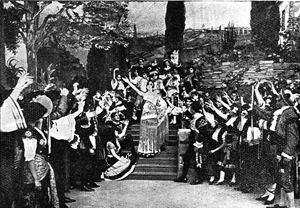 The film prima-donna receives a script. Even among the many films of the teens that comment on the medium of film and/or the film industry, Die Filmprimadonna is notable for its ‘behind the scenes’ look at the filmmaking process, and the way the film explains these elements to the audience. In the film, which survives only in part, Nielsen plays film star Ruth Breton: we see her approving (or rather rejecting) scripts, shooting scenes outdoors and on set, posing for publicity stills. Most tantalizingly, we see shots of the film laboratory itself: Ruth in the darkroom, examining the latest material. A striking shot, although if I may nitpick, a bit of dramatic licence seems to be involved – the preceding intertitle announces ‘Where the films are developed’, but this appears to show printing rather than processing equipment, with what strikes me as a slightly dodgy setup – where’s the takeup reel? (And of course, without development, the image would not be visible for Ruth’s inspection). In any case, this shot visually underlines not just Ruth’s pre-eminence at the studio but also her dedication to her work: as we are told, ‘The film prima-donna takes a personal interest in every detail of the picture in which she appears’. As the developed film dries on large rotating drums, Ruth pulls off a filmstrip for examination. She’s not bossy, she’s the boss, tugging other studio staff into her orbit to receive her critique. Although Asta Nielsen is not explicitly playing herself, there is a clear correspondence between Asta’s star image and the assertive, talented Ruth Breton. 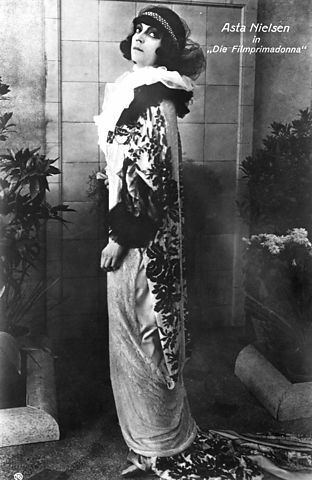 Although the word ‘prima-donna’ generally carries a slightly negative connotation, Ruth is no spoiled star but rather a passionate and engaged artist; if she refuses a script, it is because “it does not begin to approach the standard [she] must insist upon as befitting [her] talents and reputation”. This, of course, primes the audience to think of Asta Nielsen in the same terms, not merely an actress but a creative talent possessing great knowledge of the filmmaking process and for whom quality is paramount. 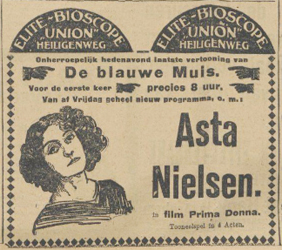 Especially in light of what we know of Asta Nielsen’s business acumen and agency, these aspects of Die Filmprima-donna collapse the boundaries between the fictional character of Ruth Breton and the star persona of Asta Nielsen. Asta strikes a pose as the audience is further instructed in the procedures of film production. 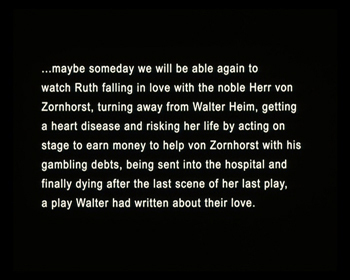 The main plot of Die Filmprimadonna is launched when we see Ruth Breton receive a screenplay from Walter Heim (Fritz Weidemann). The search for a suitable manuscript now resolved, the film details the workings of the studio and the shooting process, as Ruth and Walter become romantically involved. Ruth speaks with Walter about his script. 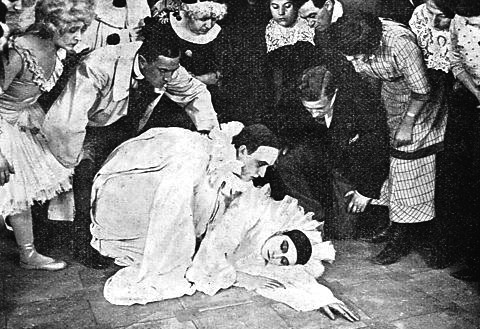 Although we are sadly unlikely ever to be able to see this firsthand, several stills at least give an idea of how this looked, including Ruth’s tragic demise as Pierrot. Of the surviving footage, one scene in particular is affected by nitrate decomposition, that destructive beauty which seems oddly fitting for a film that places such an emphasis on the material reality of film and the methods of filmmaking. As always, Nielsen’s performance stands out for its assurance, rhythm and charisma. Die Filmprimadonna is composed in long- and medium-shot, and Asta is a master at using gesture to draw the eye. For me, one of the best – and funniest! – demonstrations of this skill is the scene in which Ruth is trying to sell the studio on her lover Walter’s screenplay, concurrently urging him on. There are multiple layers of performance going on here: Asta/Ruth is trying to persuade her producer to take a chance on this pitch; she is signalling to her lover to look alive and help seal the deal; and she’s performing the movie star for the audience, who are inevitably conflating the persona of Die Asta with that of ‘film primadonna’ Ruth Breton. As well as being amusing – that segue from urgent gesture to faux-casual hand-to-chin contemplation! – for a 102-year-old film, it’s a scene that is really quite sophisticated in what it is achieving. “A young art form can only move forward through the talents of the greatest artist. And we now have a woman, an artist, who has the capacity to meet this challenge. That artist is Nielsen” – and I would add that Die Filmprimadonna is an interesting early document about the young art form in question. 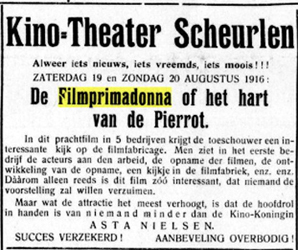 Berliner Tageblatt, 08 Dec 1913 (Union-Theater Lichtspiele); Algemeen Handelsblad (Amsterdam), 15 Jan 1914; De West nieuwsblad uit en voor Suriname, 15 Aug 1916. Die Filmprimadonna [The Film Primadonna]. Dir. Urban Gad. Berlin: PAGU, 1913. Available on DVD from Edition Filmmuseum (2 DVD set with Hamlet). This entry was posted in Film and tagged Asta Nielsen, cinema of 1913, cinema of Germany, EFG, excellent women, film about film, nitrate damage, Urban Gad. Bookmark the permalink. Another great post! I have to say while I have heard the name of Asta Nielsen I’ve never paid much interest to her or researched her before, but this will have to change now! ;-). Thank you! She’s really a wonderful actress, although her prime era of popularity was in the teens, so those films are somewhat different in character to those of the later silent era (rely more on staging than cutting, camera is placed further from action, etc). If you haven’t already seen it, get a load of her incredible dance in Afgrunden. An excellent Silents Please appreciation of Der Asta and Die Filmprimadonna!